Learn about the role RDs can play in these dire circumstances. Securing enough food to meet human nutritional needs during natural disasters has been problematic since the beginning of time. However, the nature of human vulnerability associated with food scarcity has changed. Whereas hundreds of years ago, when most people lived in rural agricultural communities, it was routine practice to store nonperishable grains, nuts, seeds, dried fruits, and dried meats at home. Local traditions and religious tenets provided guidance on which foods were appropriate and desirable. Experts believe that the "disaster risk landscape," as stated by Shultz and Galea in their article "Mitigating the Mental and Physical Health Consequences of Hurricane Harvey," published in the Journal of the American Medical Association in October 2017, is becoming increasingly complex and requires food experts to think about how to address its nutritional component. Hurricane Harvey poured trillions of gallons of rain on Texas and Louisiana, leaving 450,000 people in need of government assistance. Other recent natural disasters, including Hurricanes Irma, Maria, and Sandy; water contamination in Michigan; and forest fires in California, have taken similarly harsh tolls on the diets and health of hundreds of thousands of people. When the President issues a major disaster declaration, denoting an event that causes widespread damage, the USDA serves as the backbone of a national network of organizations that jump into action to get food to those in need. Two major laws shape disaster response policies and procedures. The Food Stamp Act of 1977 and the Robert T. Stafford Disaster Relief and Emergency Assistance Act of 1988 give the Secretary of Agriculture the authority to issue emergency Supplemental Nutrition Assistance Program (SNAP) benefits and direct the President to order the storage of adequate foods for disaster situations. The USDA's Food and Nutrition Service (FNS) serves as the national headquarters and authority for supplying emergency food. According to the USDA, during Hurricane Katrina, the agency provided $680 million in aid and 22 million lbs of food for congregate meals and household food packages. During Hurricane Sandy, the USDA invested more than $43.7 million and more than 1.1 million lbs of food for survivors in New York and New Jersey. In most cases, nongovernmental organizations (NGOs) such as the American Red Cross and the Salvation Army are the first on the ground to provide relief, including meals for survivors. The American Red Cross responds to nearly 70,000 disasters annually, which is equal to about 200 per day. To acquire foodstuffs, these organizations must contact the local USDA lead agency (which varies from state to state) to tap into USDA school food and food bank stores. The USDA also offers food to other NGOs, mainly providing nonperishable foods such as canned juices, meat, fruits, and vegetables. Commercial carriers generally transport USDA food stores. For example, the USDA Kansas City Commodity Office can ship food to where it's needed, and the USDA can arrange for transport of food between states. In some cases, the military handles the transport to ensure speed and safety of delivery. A Rapid Food Response System has been established through several Memoranda of Understanding between FNS headquarters and the states of Pennsylvania, New York, North Carolina, Ohio, Oklahoma, Colorado, and California. The agreements allow for the distribution of supplementary foods between these states in times of disaster. If additional food supplies are needed, they can be obtained through state-level USDA partnerships with the Federal Emergency Management Agency (FEMA). These partnerships are dubbed Emergency Support Function (ESF) #6 (Mass Care/Human Services) and ESF #11 (Agriculture/Food). The FNS is the leading agency for ESF #11, which is key in terms of nutrition. ESF #11 has five specific components: providing supplemental nutrition assistance; responding to animal and agricultural health issues; ensuring the safety and defense of meat, poultry, and processed egg products; providing technical assistance in support of animal and agricultural emergency management; and protecting natural and cultural resources and historic properties. However, FEMA takes on the role of ensuring that survivors receive water that's safe to drink. When local food supplies are depleted, organizations must contact the FNS to request food necessary to supply all affected households. The USDA and FEMA also partner to distribute infant formula and baby food for children housed in shelters. The USDA recommends that emergency workers "use local food first," according to the agency's manual "USDA Foods: Healthy Choices, American Grown," which was revised in September 2017. The USDA coordinates with state, local, and volunteer organizations to mobilize its first line of defense: USDA foods stored at state and local warehouses and at schools. These foods, chiefly obtained from the supplies for the National School Breakfast, Lunch, and Summer Meal Programs, include a variety of canned, fresh, frozen, and dry products such as fruits, vegetables, meats, and whole grains. Larger food packages, such as those used in school food operations, are the preferred size for congregate feeding and the easiest for the FNS to replace. In certain dire circumstances, disaster relief organizations may make smaller packages of USDA foods available to households. Because disaster situations can be chaotic, the FNS advises school food authorities to take steps to ensure they're linked with the emergency response team in their communities. They should communicate disaster plans to the USDA State Distributing Agency, create a disaster emergency contact list, and open lines of communication with all partners. School food authorities also should keep records for disaster feeding separate from those for routine school feeding. This can help ensure reimbursement for the school foods used during disasters. Beverly Girard, PhD, MBA, RD, director of food and nutrition services of Sarasota County Schools in Sarasota, Florida, led and mobilized one-fifth of her staff of 70 employees and served over 20,000 evacuees in 13 shelters during Hurricane Irma. She says that it is crucial to "train managers and administrators on an annual basis for emergency management." She emphasizes the importance of communicating in advance with vendors: "They need to know that school districts who house evacuees and first responders take precedence over other customers—we're at the same level as hospitals." Lisa Colbert, RD, assistant director of nutrition for Cy-Fair School District in Houston, a district that provides 116,000 meals per day, was on the ground, serving families food from storage with the help of her staff. Colbert says she and her foodservices colleagues were instrumental in helping to feed families who were relocated to shelters during Hurricane Harvey. "Our department harvested food from the surrounding schools that we could safely access and delivered it to two distribution sites. Getting food to the people that needed it most was a challenge. Our staff of drivers braved high waters to secure milk and food items from surrounding schools so that we could get nourishment to displaced families. Staff who were able to get to these sites organized donations and distributed these items." Colbert adds, "Many of our grocery stores were not open to receive deliveries, so having a place to feed loved ones at no cost was a real benefit to the community. Food availability and transportation were a challenge for a while. Our department operates with a central kitchen and warehouse, and we also had difficulties getting deliveries. We planned menus using food items we had on hand and worked with local vendors to receive needed items." Hospitals are challenged by emergency situations as well and often have patients with complicated nutritional needs, as well as the need for oxygen and medications. The Centers for Medicare & Medicaid Services offers guidelines for facilities' emergency preparation. These vary widely by type of health care facility. 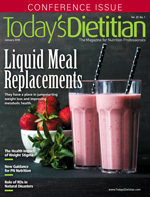 Niharika Jaiswal, MS, RDN, CDE, chief clinical dietitian at Cabrini Hospital in Dobbs Ferry, New York, which includes long term care, must maintain a four-day water supply (one gallon of water per person per day), cold food items kept below 41° F, other items (eg, bread, peanut butter) kept above 41° F, canned foods, and a supply of nutritional supplements such as Ensure and Glucerna. Girard's school foodservice team ended up providing food to three "Special Needs Shelters," which housed evacuees who were oxygen dependent or had other medical needs for uninterrupted electricity. She says schools often act as hospitals in such situations. She explains: "We completely transformed a child feeding program with all sorts of variety, fresh produce, etc, to a program intended to help people survive. Nevertheless, we kept customer service, kindness, and concern for our community at the forefront." The Emergency Food Assistance Program (TEFAP) is an FNS program responsible for household food distribution and works mainly with food banks during disasters. Food banks and other TEFAP sponsors must have previous USDA approval to distribute food during disasters in order to receive reimbursement. This type of distribution should be done only "as needed" and with clearance only by FNS regional offices. Congregate feeding always is preferred since it's less costly and more efficient. • D-SNAP is administered only in times of a declared disaster. • D-SNAP recipients must have endured damage to home or self-employment property, disaster-related expenses, food loss, income source disruption, or inaccessibility of liquid resources. • D-SNAP recipients must be legal residents in the disaster area, and this must be verified. • For D-SNAP, a "household" is defined as individuals who purchase and prepare meals together at the time of the disaster. • Unlike regular SNAP allotments, D-SNAP allotments are automatically set at the maximum allotment for household size (no variation based on financial circumstances). • There's no resource test that includes the age of household members, only liquid resources are counted, and verification occurs only when possible. • Unlike for regular SNAP disbursements, income isn't verified; only income expected to be received during the benefit period is counted and verified only when possible. • There's no disqualification for D-SNAP due to disqualification for regular SNAP benefits. D-SNAP allows the FNS to get short-term food assistance quickly (usually within seven days) to those in need of food who reside in places where stores are operational. D-SNAP is aid in the form of one month of benefits equal to the maximum benefit amount that SNAP households of the equivalent size would receive. D-SNAP benefits are issued to applicants within 72 hours and allow participants to purchase food at most grocery stores. WIC isn't designed to be a disaster assistance program. However, WIC policies allow state agencies flexibility in program design and administration to support continuation of benefits to participants during times of a disaster. WIC state agencies work with FEMA as well as their own state and local emergency services to assist participants. Evacuees who seek WIC benefits receive expedited processing. Those who have unused WIC vouchers can use them wherever they're relocated. "RDs are uniquely qualified to handle feeding large groups of people in a short time," Colbert says. "Food safety and quality are always important to us, and we were able to make sure the high standards that we use in our department were carried out during Hurricane Harvey." Colbert says that with her training, she and her team were able "to set up a kitchen, organize and distribute food quickly, and take the food that was on hand and some from local vendors to produce nutritious meals. "Making sure families had a healthful meal complete with milk, fruit, vegetable, and protein helps to ensure that they will stay nourished while dealing with a crisis," Colbert continues. She and her team also understood the bigger picture—the importance of food as a source of comfort and familiarity, especially for children, during the crisis. Colbert and her colleagues decorated the serving lines to welcome students, many of whom had become homeless during the disaster, when they returned to school. Girard agrees that RDs are key responders in such situations, but says that emergency feeding requires "RDs with excellent leadership skills," and that "emergency feeding is not business as usual." She adds that RDs working in this capacity "have to make decisions and stay firm, think outside the box, and completely roll with the punches." • acting as a liaison officer by communicating your organization's plan with other response agencies and institutions. • Emergency System for Advanced Registration of Volunteer Health Professionals, www.phc.gov/esarvhp/pages/default.aspx. RDs have an important role to play in nutrition emergency preparedness for and nutrition assistance following a disaster. Whether working with NGOs, schools, or other organizations that bring relief to those impacted, RDs can help ensure the safe delivery, storage, preparation, and service of healthful, nourishing food. — Christen Cupples Cooper, EdD, RDN, is founding director and an assistant professor of nutrition and dietetics at Pace University in Pleasantville, New York. 1. Marsella AJ, Johnson JL, Watson P, Gryczynski J. Ethnocultural Perspectives on Disaster and Trauma. New York, NY: Springer Publishing Company; 2008. 2. Sabaté J. Religion, diet and research. Br J Nutr. 2004;92(2):199-201.